We are indebted to the late Miss Emma Payne of Rosedere fame for a real step ahead in the improvement of our white longhairs. GC Rosedere White Hope of Arlington was by the blue, Lavender Centurian and CH Rosedere White Orchid, a blue-eyed white, and White Hope was our first copper-eyed white Grand Champion. 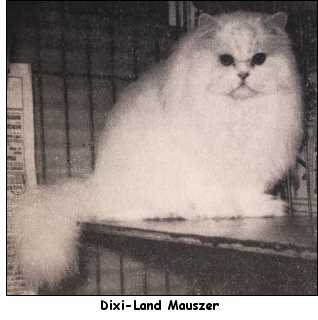 This male was aptly named as he was the progenitor of our present day top-winning white cats. 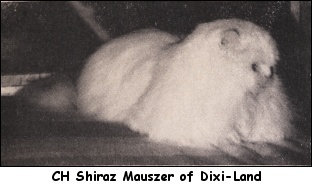 The first female Grand Champion was the blue-eyed Queen High, owned by Mrs. Rymal. It was quite an achievement in those days to win a Grand Champion title as the shows were mostly single ones and the number of champions were few. 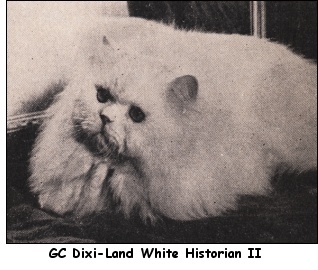 Since it is well known that blue cats excel in type and physique, one of the leading blue females of her day, CH Dixi-Land’s Margaret Rose of Allington (imp) was bred to GC Rosedere White Hope of Arlington, resulting in two other history making whites, namely GC Dixi-Land’s White Historian (the first) and CH Dixi-Land’s Innocence. Being ignorant at the time about the dark spots that often appear on the heads of white with blue in the pedigree, the breeder of these whites thought she would have a pet quality cat on her hands. This spot is only temporary and is not counted against kittens that have them. This brings to mind an incident of a number of years ago. A white female was sold with the guarantee that if her head spot didn’t fade out with maturity that something would be done about it. In due time, the buyer reported that the female had had a litter of kittens but the spot remained. True to promise, the breeder bought back the female only to find that the only dark spots to be found on the cat were fleas! Incidentally, the headlines of today would be different but for the true story of the disappearing head spot. The writer presently owns a direct maternal line from her first two whites. Some are blues as a blue cross is wisely used to hold the desired type. We want type good in all sections – in other words, a well balanced cat and not one that is exaggerated in any one point at the expense of others. If the nose is too peke-ish the lachrymal duct is apt to be occluded and the cat will have weeping eyes. The first cross of the white with a colorbred blue may result in the majority of blue, but these blues when bred to a white should give mostly white kittens. It is thought by some novice breeders that white are bred with blues to lighten the shade of the blue. This is a mistake as the resulting blues will be the shade of blue carried in the genes of the blue parents. It is unwise to use a cream cross although it may be bred from a blue as it is known that creams have appeared from whites that have cream several generations back in the pedigree. We do not want creams in our white pedigrees! There are several different shades of white cats. This isn’t always obvious when judged individually, but when several are viewed side by side, the difference in the shades is easily detected. We want purity of color in our whites! There are three separate white classes, namely: blue eyes, copper eyes, and odd eyes. The blue eyes are often deaf. Whiting’s explanation of this is from white spotting in the ear. Another theory is that the anatomical structure of the inner ear controls the vibrations of sound. An occasional copper-eyed white has been known to be deaf when descended from a blue eye. As in all long hairs, daily grooming will prevent tangled coats and also lessen the amount of swallowed hair. If an occasional meal is missed it may result in the expulsion of a hairball. If grass is allowed it should be only with an empty stomach or food will also come up with the hair. A pinch of boric acid powder in each ear once weekly will prevent ear canker and parasites. This powder on the skin of the tail will lessen the discoloration caused by the oil that is secreted on the tail. It is well known that lean beef and horse meat are the basic foods for cats. This may be varied by feeding the vital organs of the beef and with fish and fat-free chicken and rabbit. Our present day dry milk powder well mixed with the meats gives desired minerals and vitamins without the laxative action of fats which are not easily digested by cats. And if a commercial dry food may be mentioned, the Purina Cat Chow is relished by our cats, as a treat or an extra.